Growing vegetables upside down offers advantages such as easy harvest, avoidance of soil-borne diseases, saving space in your in-ground garden, larger harvests and better air circulation for the plants. The planters can be hanged just about anywhere, even in places where it may not be possible to grow a traditional garden, such as an apartment balcony, patio, roofline, or suspended on hooks near a flowerbed or along a walkway. Tomatoes thrive when planted upside down. Many home gardeners report bigger yields from the hanging plants compared to those planted in the ground. Compact tomato plants do best in upside down planters, as well as those that produce smaller tomatoes. Larger plants tend to produce roots that will not fit well within the container and long stems are likely to be when hanging. Those that produce large fruit may become too heavy and cause damage to the plant. Varieties that produce cherry or grape tomatoes work well. Roma tomatoes, which are large enough for slicing, but not as large as many other types, also work well. Cucumbers are ideal for growing upside down because of their vining habit and light weight. Compact varieties do best in such containers. Look for cucumbers that have a bushing habit, or are determinate, meaning they will not spread out in long vines. Those labeled compact are also usually determinate. The largest varieties of cucumbers that have a vining habit may have trouble in an upside down container without some sort of support for the vines. Many pickling cucumbers have a bushing habit, but varieties like Spacemaster, Salad Bush or Slice More, can also result in high yields when grown upside down. 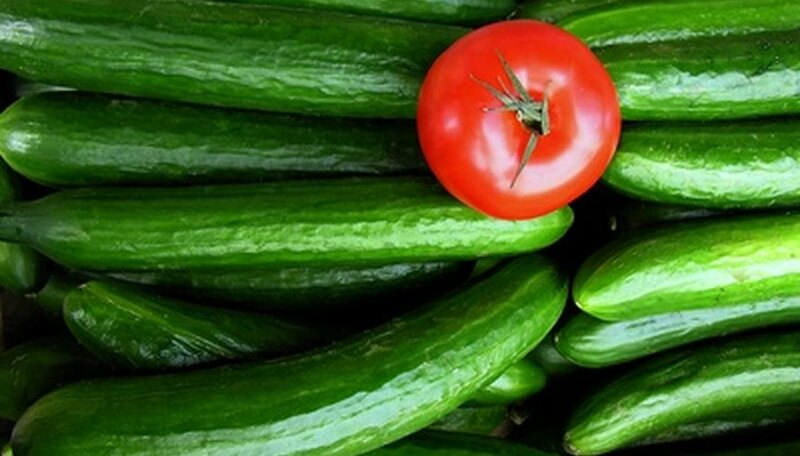 Since cucumbers are susceptible to many soil-borne diseases, growing them in containers can eliminate these problems. Heat-loving peppers are probably more suited for growing upside down than just about any other vegetable. They thrive and produce best when the soil is especially warm, and the soil in a hanging container gets especially warm in the summer. Since most pepper plants remain small compared to tomatoes and cucumbers, the size of the mature plant is not as important as the size of the adult pepper. Some larger peppers, like bell peppers, may not be ideal for hanging upside down. Also, most bell peppers have stalks that are more fragile than other types of peppers, and they could break easily if bumped while hanging. Varieties like jalapeño, habañero, cayenne, sweet cherry and tabasco are highly suited to growing upside down. Growing squash upside down requires careful selection of plants. Like other vegetables to be grown upside down, the plants must be compact and the vegetable produced must not be too big or weigh too much. Some mid-size squash may be grown upside down if it does not weigh too much or if support is given to the maturing squash. Varieties best suited for growing upside down are table gold acorn, cream of the crop acorn and gem squash. Small pumpkins can even be grown upside down, if you are careful to make sure the vines do not break. Snack Jack and Baby Boo are two varietes small enough to grow in hanging containers.